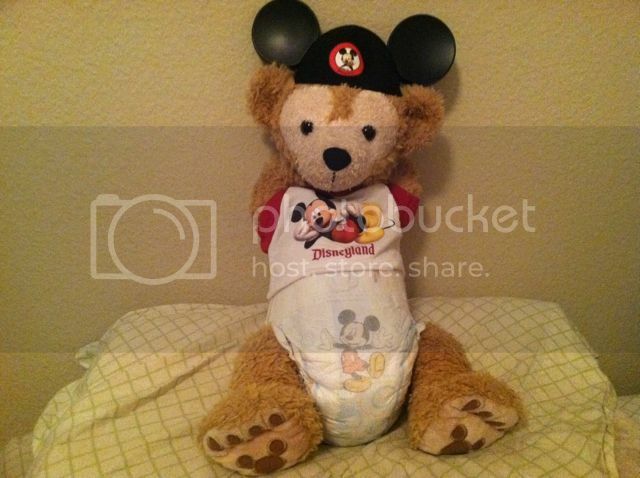 So I had my Duffy try on his Build-A-Bear Mickey Mouse Club outfit. I always love that expression, placing his paws in his mouth and if he sees something it makes him happy. Here he is all relaxed as a baby Mousekateer. And Mickey loves it when he's dressed like that. I'm back after a 3 day trip to WDW. I have a TON of photos to share. I just need to get them uploaded and edited. Congratulations on the new baby boy, Esmeralda! 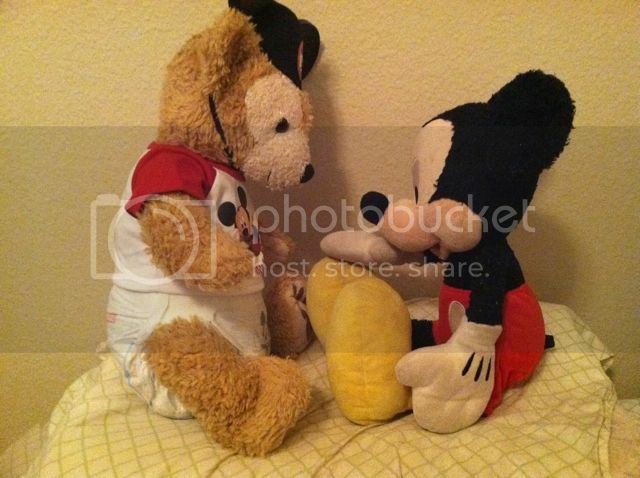 It looks like Duffy has a new best friend. UGH! I had posted some of my pics from the weekend but apparently MC had a glitch and they didn't post! Well, here they are again sadly sans captions because I am not going through all that again. I'll post Day 2 photos later. We got to Epcot around lunchtime and I saw dark storm clouds coming, so made a beeline for The Land to have lunch and wait out the rain. While I ate, Duffy did some coloring. After a spin on Living With the Land, the rain had let up, so we headed to World Showcase to kill some time before British Revolution started their sets for the day. As always, British Revolution was awesome. It was still a little rainy during the 3pm set, so I had Duffy stuffed into my backpack. When I went to talk to the band afterwards, they all asked, "Where's Duffy?" They know me and they love Duffy! I told him he was hiding in my bag because the rain doesn't mix well with his fur, but he'd be out for the 4:30 set. Duffy wanted another photo with the band since he now has his Union Jack shirt to match the shoes. They loved it and were impressed with his Teddy Olympics medal too! The humidity from the rain earlier totally sucked my energy, so we headed out around 5:00. Duffy wanted to get his photo with the fire truck in Innoventions first though. A cast member at The Land told me the Build A Bear at the Florida Mall has lots of Disney clothes and costumes, so I went to check it out. OMG! I saw lots of stuff I could only get online and MORE! They had the costumes of Cruella, Hook, Ariel, Ursula, Pooh, Tigger, Eeyore, Maleficient, the princesses... They even had the Stitch costume, which isn't even available online anymore! I grabbed that along with a Goofy hat and the last Pluto hat. Then I remembered the next day I was meeting up with a friend and fellow Duffy fan, so got her Duffy some pirate Mickey ears. Great pictures, Aimster! I have to say I love your Duffy's face, it's just perfect. Also love the picture of him with British Revolution. I'm sure they liked his enthusiasm for all things Britain! The medal just puts him over the top! aimster. I just have to ask if your Duffy likes One Direction. I love all your pictures also and your Duffy is perfect. I wish mine looked that good but I did not pick it out, I ordered online. Do you brush him or do anything special with him to keep him looking so good? We like ONE song by them but that's it (and that's pushing it as it is). Other that, we can't stand them. I'm in my late 30s so I'm not their demographic/target audience. My Duffy is a rocker bear for the most part. He loves rocking out to British Revolution because they play a lot of our favorites (The Who, The Rolling Stones, Led Zeppelin, The Beatles, Pink Floyd, Duran Duran, The Police...). He's quite good at the Pete Townsend guitar windmills, but he wants to be a drummer. But we like other kinds of music too. I do actually. I keep his fur fluffed up with a soft bristle pet brush (his fur gets very ratty-tatty from carrying him around and playing with him). I also use the bear clear stuff from Build A Bear to clean him up if he gets dirty (works great on his muzzle and paws). And when he starts getting stinky I spritz him with a little Febreeze. Last edited by aimster; 08-22-2012, 05:49 PM. Time for some British sweets! This custodial CM was awesome. At the end of British Revolution's 4:30 set, they do "Bohemian Rhapsody" by Queen. When they get to the part where they totally rock out, this guy let loose and the crowd went nuts! They loved him. Duffy wanted to get a photo with him afterwards. My friend Kristen ended up stopping by MK before going home and ended up staying, so I went over there to hang out some more. Oh the shenanigans! Some random people gave me 5 Fast Passes to Dumbo! Kristen and I each used 2 so we rode twice in a row. We left MK before the Electrical Parade and fireworks because were both tired. Kristen had to drive home and I had a craving for wings for dinner (there's a Buffalo Wild Wings near my hotel in the Crossroads). And that's it! Hope you enjoyed! Very adorable of Marie holding Duffy. She is pretty much a rare character to meet here at the U.S. Disney theme parks (notably the Disneyland Resort), but it's a good thing she has her own greeting spot at the French pavilion and at the Tokyo Disney Resort. 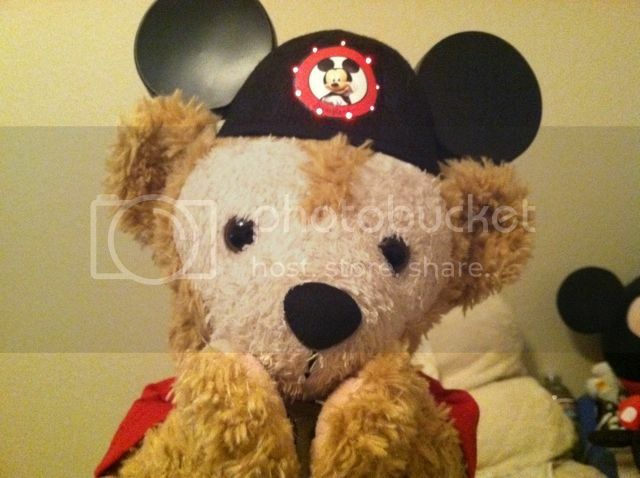 Also, your Duffy looks very cute wearing that Goofy hat. Marie is pretty common at WDW... well at Epcot at least as she's out pretty much every day in the France pavilion. That day it was storming bad at noon so they had a bunch of "bonus" characters in the hallway behind Club Cool/Character Spot. Besides Belle and Marie, I saw so Aurora (who actually looked more like a drag queen... WAY too much makeup), Snow White and Jack Sparrow! Chip & Dale were back there too, but they usually meet & greet outside near the Character Spot, so their line was just moved indoors due to the storm. Earlier in the week at Epcot, Jane from Tarzan and Cruella were out at Epcot (they're getting ready for Halloween & Epcot is the perfect place for bonus characters). Great finish to the story, Aimster. What are those "Bear" sweets? Are they chocolate or something? Banana chocolate...yum! Marie looks like she's going to eat Duffy. It sounds like you guys made the best out of the Carousel of Progress breaking down. Of any place to have a good laugh, it's at a Disney park. I didn't see them myself. A friend of mine did though. They saw Jane near the International Gateway (between the UK & France) and Cruella near Innoventions. This is not a permanent thing. They're just getting characters ready to put in the MK for the Halloween parties, which start next month. But if you want to see extra/bonus characters right now, check the hallway behind the Character Spot/ice cream parlor/Club Cool, the International Gateway and next to the American Adventure. No guaratees though as it's schedule/weather permitting and a LOT of luck and timing. Hey, check it out! We got our very own beach chairs! Now all we need is a beach to use them on. Hmm, but Lil D has an idea. Ah, nothing like a relaxing day at the beach!